This section demonstrates how Java server side and Apex interact with the Database using code snippets. 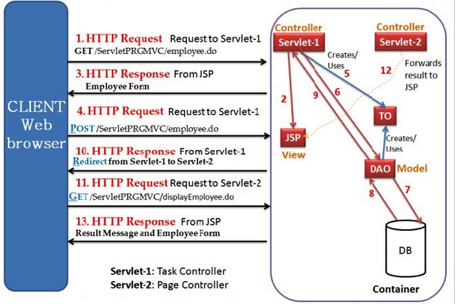 Implement a controller using Java servlet. The client requests are received by this controller. Implement a helper for the controller using Java class (POJO) or session EJB. Need to implement all the required beans out of which the controller picks the respective bean based on the parameters received in the request. Implement and configure a set of classes to establish a connection to the database (JDBC). The Controller servlet then by itself or through a controller helper communicates with the middle tier or directly to the database to fetch the required data. Implement the beans so that the controller sets the resultant JavaBeans (either same or a new one) in one of the following contexts – request, session or application. The controller then dispatches the request to the next view based on the request URL. The View uses the resultant JavaBeans from Step 4 to display data. Note that there is no presentation logic in the JSP. The sole function of the JSP is to display the data from the JavaBeans set in the request, session or application scopes. Implement an Apex Class for Controller. Most of the code are auto-generated. Only business logic need to be implemented. (Controller). 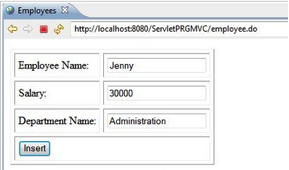 Create a simple application to accept employee details, store it in the database and display the list of employees using MVC pattern. Configure the JNDI DataSource in Tomcat by adding a declaration for your resource to your Context in context.xml. This can be done by creating the following context.xml in META-INF folder of the project. Create Transfer Object/ Domain Object class and name it Employee.java as illustrated below. + employeeName + ", salary=" + salary + ", deptName="
Create a Data Access Object (DAO) class and call it EmployeeDAO.java. The constructor of the class gets the data source object and stores it. DAO method creates Connection and Statement object. After executing the query, it returns the result to the upper layer. If any exception occurs, it creates ApplicationException with a message and cause (Throwable object) of the exception and throws it. String query = "insert into employee(emp_name, salary, dept_name) values('"
Create a Controller class (Servlet) and name it EmployeeServlet.java. * redirection to avoid duplicate form submission. 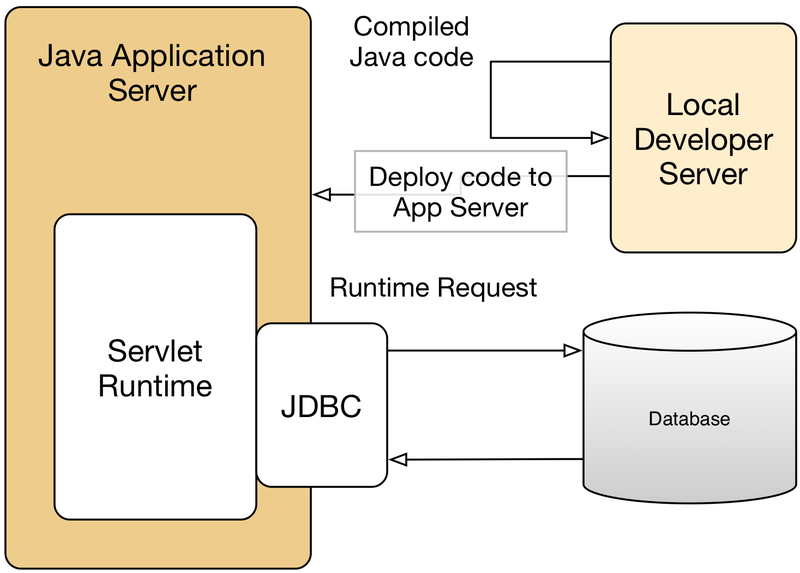 When the application is deployed in the tomcat container, the container looks up the JDBC resource and injects it into Servlet. This Servlet redirects to another Servlet setting the success value. Create a new JSP page(View of the MVC) in WebContent folder and name it as “displayEmployee.jsp“.It displays the form if the result attribute is empty, else it displays the result (stored in the request scope) forwarded by the DisplayEmployeeServlet. Change web.xml to include the mapping for EmployeeListServlet. Deploy the project on tomcat and restart the server. Open url at http://localhost:8080/ServletPRGMVC/employeelist.do and the output will be as illustrated. Servlet in doGet() method forwards the request to JSP. JSP sends HTTP Response with HTML content to client. Client submits the form to EmployeeServlet as HTTP POST request. Servlet creates Transfer Object (TO pattern). 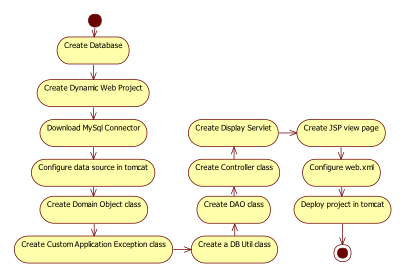 Servlet invokes a method in Data Access Object (DAO pattern). DAO accesses database to insert a row. Database Result is returned to DAO method. DAO returns the result to Servlet. Client makes a new HTTP GET request to DisplayServlet. 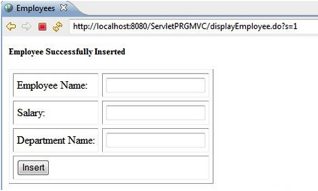 DisplayServlet sets request attribute and forward it to JSP. 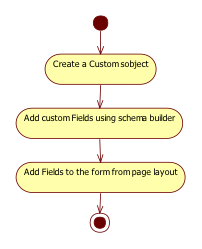 JSP displays the result to the client by reading the request attribute. Create a new Custom object and fill Employee object(table) details. Finally click save. 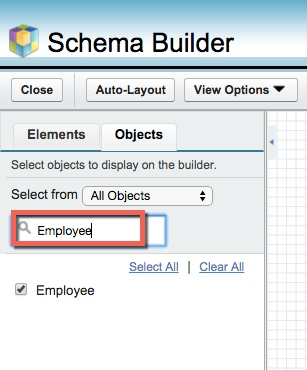 Click on the Schema Builder in the Quick Find Box and then select the Employee object to add a new field. 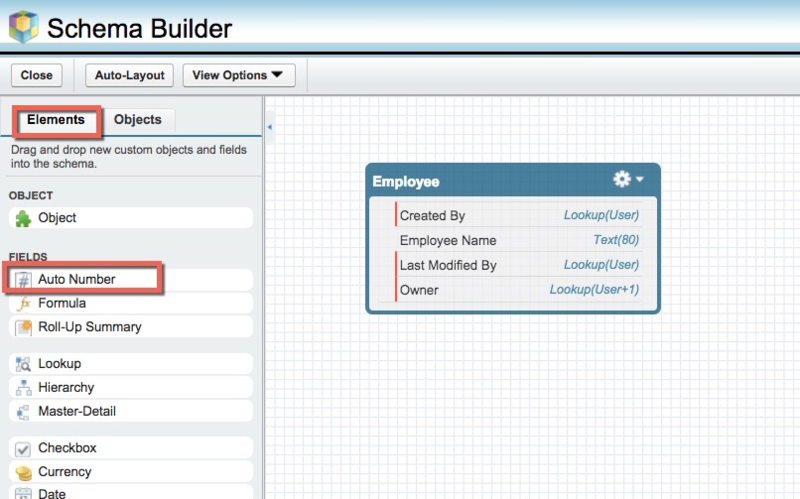 In the Elements tab, select Auto Number and drop in the Employee object. 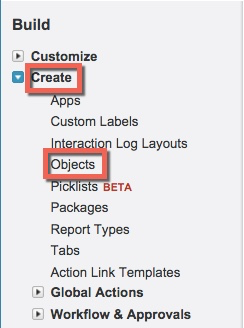 Now navigate to the Employee object (refer the step2). Click on Edit within the page layout block within the Employee object. Select the EmployeeID, Employee Name, Department and Salary from top pane and drop in the Information Section as shown in the diagram and click on save. Now click on the Employees Tab and enter data sample data and save. 9.Click Employees tab to see the list of data. 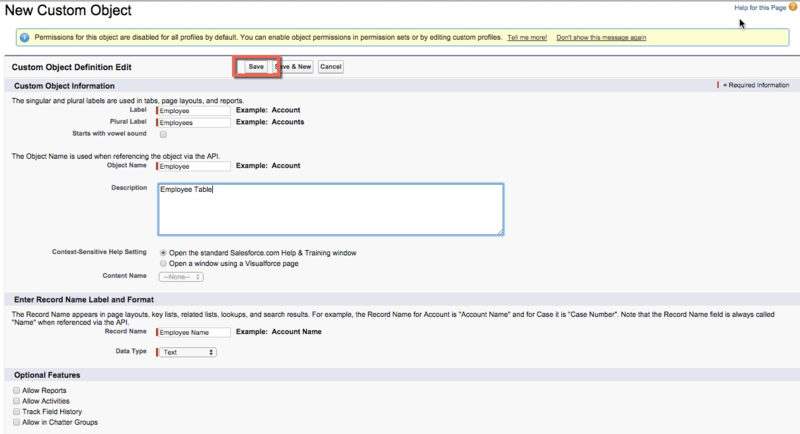 Several views can be created to display the records with appropriate fields. 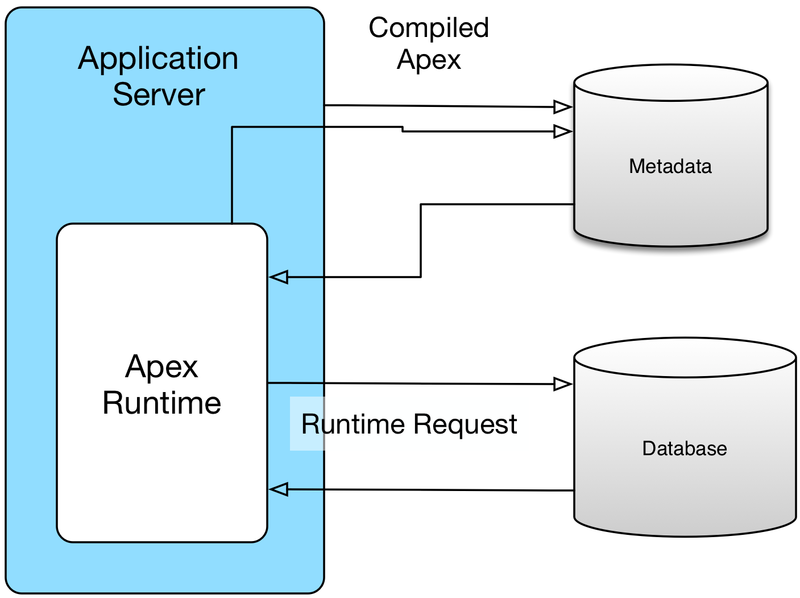 In this tutorial we learnt differences in the development as well as runtime components between Java and Apex.